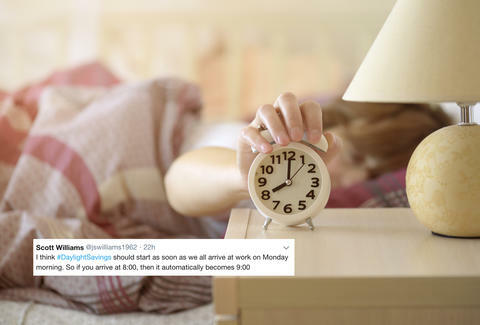 Daylight Saving Time Ruined Everyone's Day and Twitter Is Furious. And Tired. Daylight Saving Time has returned yet again. And no one was prepared for it. You might know it's coming intellectually, but physically and emotionally the day becomes a test of will that we should all commend ourselves for passing. The government should pass out little blue ribbons with clocks on them or something. Incredibly, Florida just joined the vanguard of states that have rid themselves of Daylight Saving Time, but the rest of us seem content to do something silly and inconvenient because, well, that's just how it is. Originally Daylight Saving Time was an effort to reduce consumer's energy bills in the wake of World War I. Today, put simply, it doesn't do that. In fact, DST reduces bills by just 0.03% annually, according to a 2008 study by the Department of Energy. So until the rest of the country catches up to Florida (not often you get to say that), we just have to grin and bear the yoke of the wild clock. But it's slightly more bearable knowing that we're all in it together, so check out these takes on the struggle that was today and know that at least you're not alone in your anger and your grogginess. This is dumb. We should stop it. I tried to explain why we do #DaylightSavings to my son, but it ultimately ended with, “it’s just stupid and lazy, like why we still use pennies” and now I’m just ranting to my toddler about things I don’t like. Does any politician have “end daylight savings time” on their list of campaign promises? We might also consider voicing our concerns to elected officials, but tweeting is fine too. James Chrisman is a News Writer at Thrillist who things that the only true time is party time. Send news tips to news@thrillist.com and follow him on Twitter @james_chrisman2.